Hello there! I’m excited to be part of MFT’s little jaunt ’round the interwebs….and since it’s possible it’s your first trip to my blog – welcome! I’m Sandy, and I’m a chocoholic, I’m in training for the Silliness Olympics, and I’m a self-proclaimed art nerd! I color #allthethings! 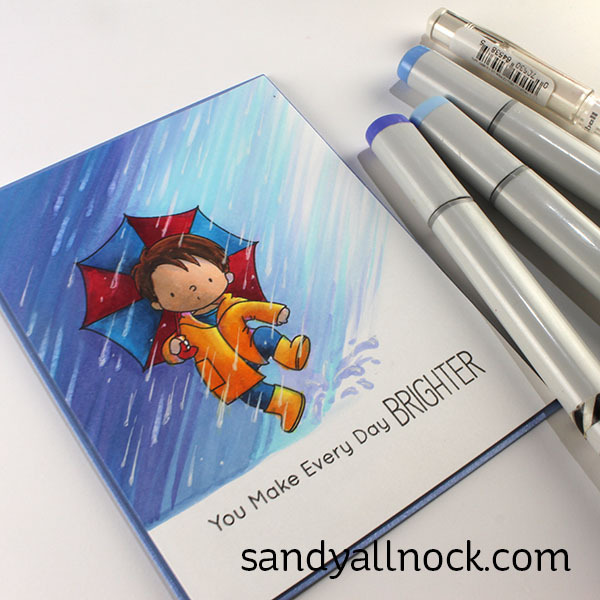 Today’s card uses Puddle Jumper from the new release….The rainy background was a bit of an accident, but I’m thinking of creating a video for it soon if there’s a need? Is it kinda self-explanatory-looking…? Or maybe no. LOL. I see stuff and can figure it out, but I know lots love to get the full on how-to! That’s one of the reasons I have a whole site just for classes. Classes in Copic, in watercolor, in Bible journaling, in drawing….lots more are in the works! 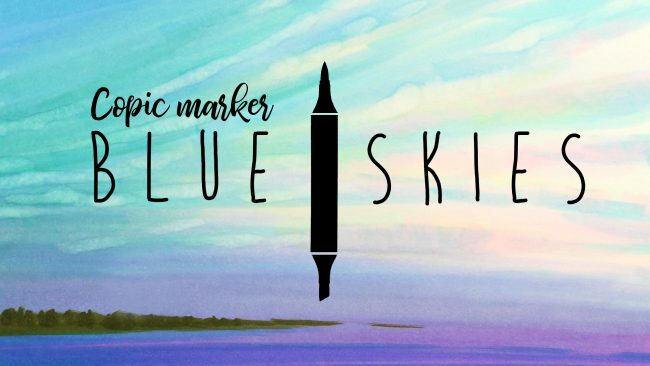 Including brand new classes on coloring Blue Skies. You can check all that out over HERE. I hope you have a WONDERFUL day…be sure to subscribe, coz there’s more fun to be had – including a fun video coming later today! Just subscribed to you channel and would love to enjoy your videos and echo all of the above Cheers ! yes please, a video would be nice; I do understand you’re really busy, so sometime, pls. & thx..
Another stunning piece of art. Yes we need a video…don’t have copics but just watching your working progress inspires me to get the crafty stash out. Waiting in anticipation!! I love that little boy, please do a video. Thank you for sharing. Yes please, to the video. Love the background. A video would be much appreciated. Adorable and perfectly HAPPY! I have always been a fan/student/admirer (not in a creepy way) of yours. You have taught me so much! It’s kinda funny though…great minds etc. in all. I just finished a project this weekend very similar but of course I like yours better. 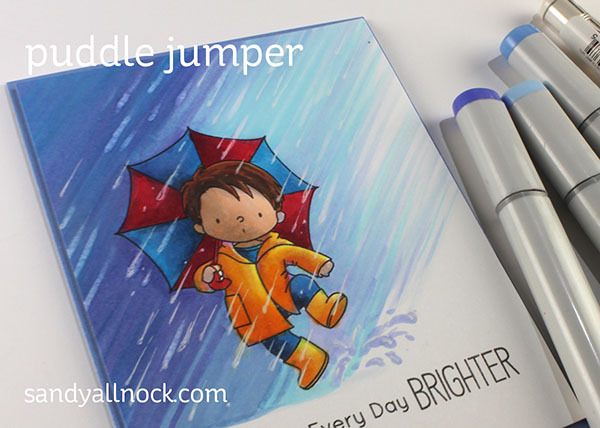 Did you use a gel pen for the rain or a white pencil? Thanks for sharing and teaching and all you do! BIG HUGS! That is just so gorgeous! Yeah, a video is necessary. I tried to figure out the precious puddle jumper but, well, I’m a copier, not an inventor. Love this card!! Yes, please share a video. Thank you! Great card. Just got this set along with his girlfriend. I love your videos, so yeah go ahead make my day! Would love to see a video on how you created the sky, rain and puddles. I too am a chocoholic and have just discovered a chocolate humus that tastes like chocolate pudding and doesn’t make me feel guilty that I ate the whole thing! I was searching for the video, I am so used to have the video LOL. Doesn’t matter, I love your writting aswell, you write how you talk. Thanks for your gorgeous card and yes if you have time, I like the video to see. I love the rain look and would love a video. Sandy you may be a chocoholic and art nerd but don’t forget dog wrangler. You need to add that to you resume!! This is beautiful! I’d love to see the video! Oh my goodness, AMAZING! I would love to see the process! Love the way you did the background on this card! Would love a step-by-step for those of us who are a bit more Copic-challenged! Thank you! PS – you knew I meant that I already ordered this stamp set, right?! RIGHT!? I already ordered this card, so would love to see any tutorial you do using it! In these days of global warming, we’re seeing lots more rain than ever, so we may as well “go with the flow”. YES please! I would love to see the video. Its an adorable card (and sometimes I can figure it out just by looking at it too) but if I really like a card, I still enjoy seeing someone else’s process and I ALWAYS enjoy watching you work. So please, bring it on! I love that rainy sky! So happy to be MFT Friends together today, Sandy! Sandy, I love this cute card. Please do the video showing how to do the rainy background. I’m one of those that has to see something to learn. Thanks. Awesome awesome! You are amazing! I love how you colored this card!